Cobblers goalkeeper Matt Ingram is facing a race against time to be fit for Saturday’s Sky bet League One clash with Walsall at Sixfields. The Queens Park Rangers loan man suffered a shoulder injury in the 0-0 draw with Bury a fortnight ago, and after being rested for the Checkatrade Trophy trip to Portsmouth, wasn’t fit enough to travel to Oldham for Saturday’s 5-1 loss at Boundary Park. Town boss Jimmy Floyd Hasselbaink confirmed on Tuesday that the shotstopper is on the mend, and that he is hopeful he will be available for selection this weekend. Elsewhere, the injury news is mixed. 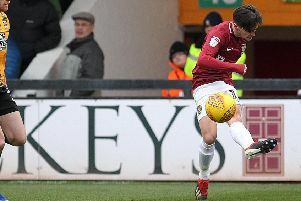 John-Joe O’Toole has suffered no reaction to his return as a substitute at Oldham at the weekend, and although the midfielder is still in some discomfort with his ankle problem he will be available to take on the Saddlers. Sam Hoskins is a serious doubt for Saturday as he has yet to train since turning his ankle last week, while Daniel Powell is closing in on full fitness following his troublesome hamstring strain. Hasselbaink is hoping the wide man, who hasn’t played for five weeks, will train fully this week, and be available for the weekend. One player who won’t be playing against Walsall is Shaun McWilliams. The teenager hasn’t featured since the 0-0 draw with Bury, reportedly missing the Pompey clash with a slight groin strain. But it appears McWilliams has an issue with growing pains, as many young footballers do, and that is causing him pain every time he kicks the ball. He will be sidelined until the problem clears up.